Einige Materialanschaffungen des letzten Herbstes habe ich heute ausprobiert & in zahlreichen Varianten kombiniert, und hierfür zum Beispiel auch Keramikelemente hervorgekramt, die ich vor nunmehr fast 3 Jahren gebrannt hatte. Hier gefiel mir zum Beispiel die Farbe unendlich gut, und die Glasur musste unbedingt mit – gebrannt auf weißem Ton waren sie mir dann etwas zu fade, und so stand die Glasur nun 3 Jahre im Schrank.. wird ja nicht schlecht, zum Glück. Dieser Pastellton gefällt mir nun kombiniert mit Kupfer – welchem ich im Moment meine größte Aufmerksamkeit schenke – wiederum sehr gut; und zum Glück habe ich nach und nach verschiedene Werkstoffe und Werkzeuge angesammelt, die ich für die heutige Kreation benötigt habe. Hier einige der Ergebnisse – die einzelnen Teile mit der Öse sind Ohrhänger; für die Brisuren muss ich aber nochmal in dei Werkstatt, daher noch nicht ganz komplett heute. Mir juckt es schon wieder in den Fingern, weiterzumachen.. aber für heute bin ich zufrieden und es heißt erstmal: Creation completed!! When I have hours like the last ones, I’m really grateful for my passion for collecting materials. If I see something I like to use for my jewelry (or sewing, or pottering, ..) – no matter if because of the material, the age, the size, the structure or due to other characteristics, I really have to get it. And of course I also have to buy it when I see it in the internet.. – the more stuff I can get for store, the better. You don’t ever know, and in most cases I already have ideas when I place it in my shelves at home or in the studio. I really don’t know a limit for that (like many of you as I know for sure); but I really stopped trying. Until now I never regreted it, and when I dig out some old glass beads I fell in love with at the age of 13, I know, that it’s ok like it is. Today I tested some new acquisitions from last autumn. I combined them in different ways; and I also digged out some old ceramic pieces I made almost three years ago. Here I liked fot example the colour, and I really had to buy it. Seen on the white clay I thought it’s kind of boring, and so I forgot about it for three years now. Fortunately it doesn’t deteriorate. By now I really like this pastel green together with the colour of copper, which I like the most in general at the moment. I’m glad that I bought different materials and tools one after another during the last year, which I needed for today’s creation. Here you can see some of the results; the small pieces with the bails are for earrings; only the wires are missing. I have to go to the studio to form them. I’d really like to continue immediately, but I’m satisfied for today, and can only say: Creation completed!! Alle drei stammen aus der Nadel von Mara von faules Mädchen, wo ihr noch viele weitere schöne in diesem Stil finden könnt. I’m trading a lot these days – I think I already mentioned the trading package with some DaWanda-sellers? And there’s also going to be a christmas-trading-circle this year, and these treasures from another exchange just arrived. 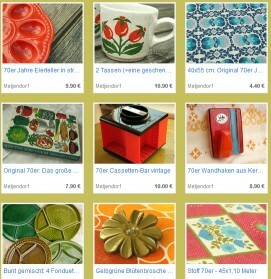 All of them are made by the needle of faules Mädchen, where you can find many more of this kind.